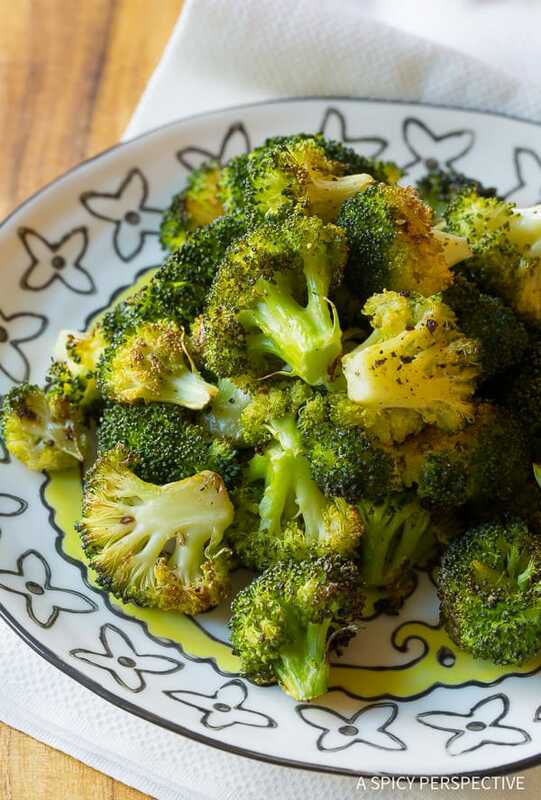 Perfect Oven Roasted Broccoli Recipe – with slightly charred edges and a touch of garlic. This roasted broccoli recipe is perfect for any meal or even as a snack! Broccoli may not be the sexiest vegetable, but it sure is improved by a quick roast under high heat. If you love oven roasted squash or were swept away by the roasted cauliflower craze, you are going to go nuts over today’s Perfect Roasted Broccoli. How Do You Fix Roasted Broccoli? This simple recipe is my favorite way to eat broccoli, roasted as-is with a hint of garlic, or dipped in creamy sauce… Or mixed into Buddha Bowls. Roasting broccoli florets on a baking sheet brings out their natural sweetness, tenderizes them, and gives them crispy edges. 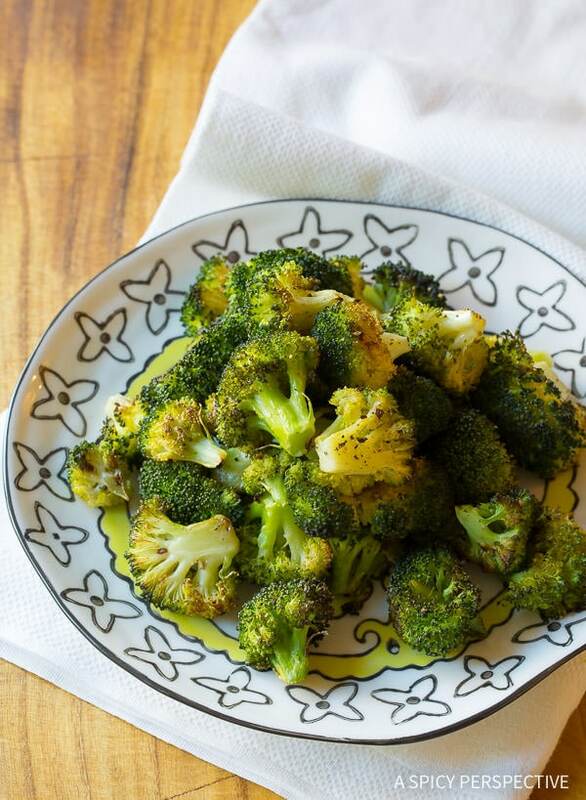 With just a quick toss in olive oil and a little garlic powder, salt and pepper, you get the very best flavor from the broccoli and a touch of zest. The key to this Broccoli Recipe is to not use too much or too little oil. If you don’t use enough oil, the broccoli will steam more than roast, leaving the broccoli with flimsy edges. If you use too much oil, the broccoli will be greasy and limp. 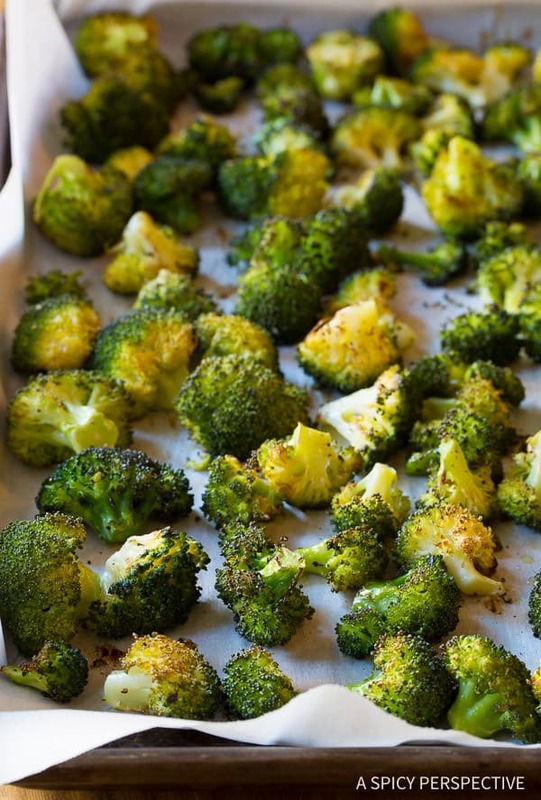 Use just enough oil to fully coat the broccoli florets, without any dripping, or pooling on the baking sheet. Can I Make This With Frozen Broccoli? You can make roasted broccoli with frozen broccoli but, the texture turns out better if you use fresh. How Do You Roast Broccoli Without Burning It? 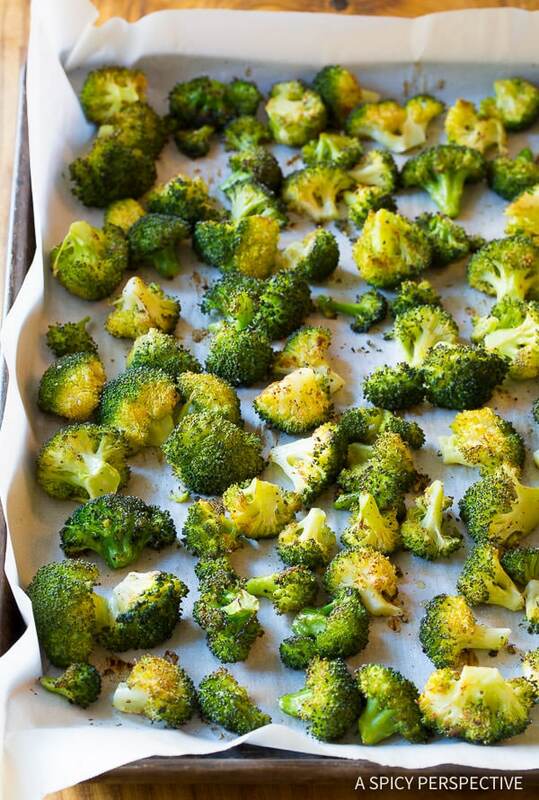 Spread the broccoli in a single layer over the baking sheet. Roast in the oven at 450 degrees F for approximately 15 minutes, until the edges are slightly crispy. Roasted Broccoli is so easy to make. Anyone can do it. Just crank the oven up, watch the amount of oil you use, and don’t over season the broccoli. It will stay green and earthy, with just enough crunch to make your kids (or picky adults) take notice! 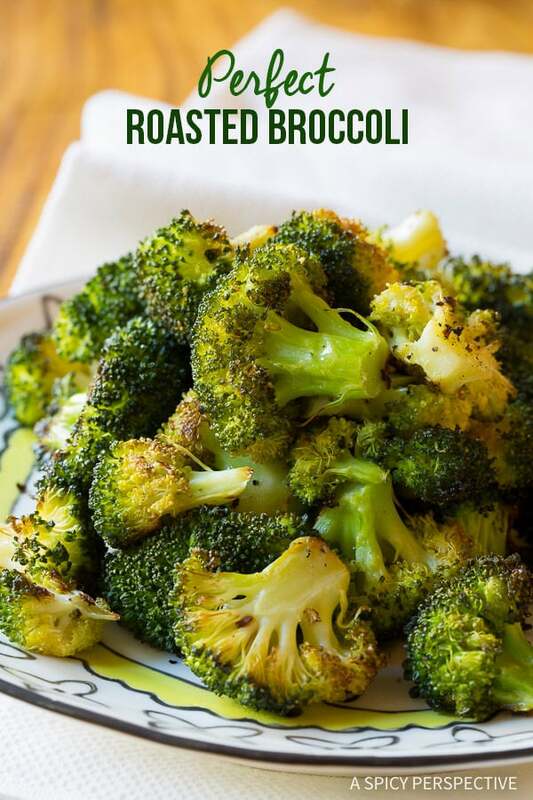 See The Recipe Card & Video Below For How To Make Oven Roasted Broccoli. 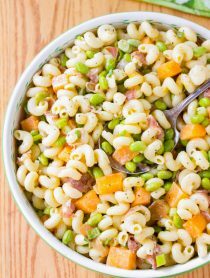 Other Healthy Recipes You Might Enjoy! Oven Roasted Broccoli Recipe - with slightly charred edges and a touch of garlic this roasted broccoli recipe is perfect for any meal or even as a snack! Preheat the oven to 450 degrees F. Line a large rimmed baking sheet with parchment paper. Trim the broccoli into small bite-size florets. Pile the florets onto the baking sheet. Drizzle the oil over the top, then sprinkle with 1/4 teaspoon garlic powder, 3/4 teaspoon salt, 1/2 teaspoon cracked black pepper. Toss to coat well. 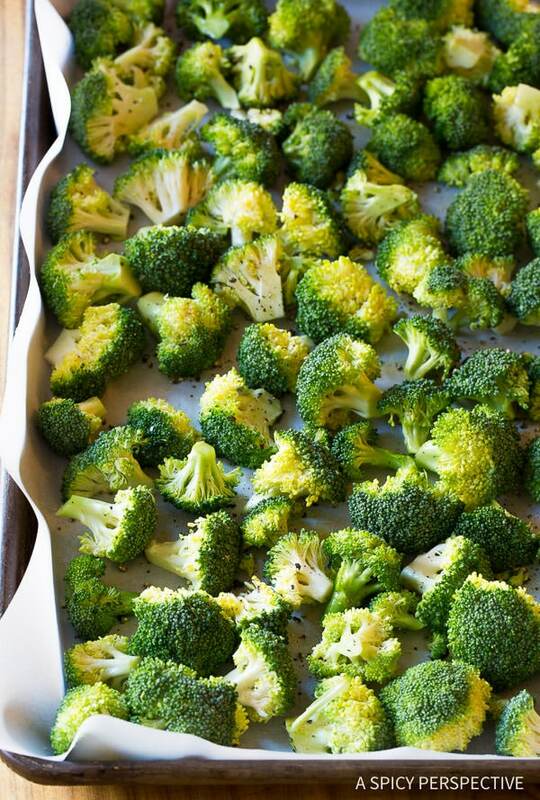 Spread the broccoli in a single layer over the baking sheet. Roast in oven for approximately 15 minutes, until the edges are slightly charred and crispy. Serve immediately. 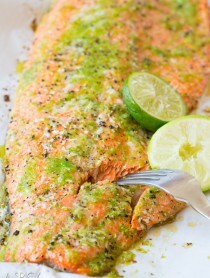 Loved the garlic powder in here! Simple but splendid. I loved it! Easy to make and delicious!! This is so unbelievably delicious! This is the only way I’ll eat broccoli! Thanks for all your tips as I hadn’t been following a recipe and my results were hit or miss. This roasted broccoli was wonderful! Hi can you make this with frozen broccoli? You can make it with frozen broccoli, but the texture turns out better if you start with fresh. My family actually waits in anticipation for me to make this when I get broccoli. It’s the only way I prepare it anymore. I tried garlic bread spread, and it worked pretty well! Thank you so much! 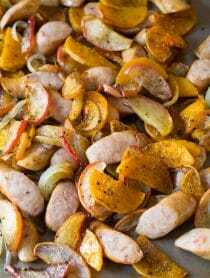 Try this with BBQ spice and Fry-Light oil spray instead of olive oil – it’s a low-fat alternative, and still tastes GREAT! I have roasted broc like this every day – never gets old! OMG my family fell I need love!!!! I made this just because I was tired of the same old same old. My family likes broccoli but they loved it so much that my daughter in law asked for the recipe so my son and grand kids would eat it. They won’t eat it any other way. That’s awesome. To get kids to eat veggies is big in my book so bring it on with the roasted broccoli!!!! Thank you! Anyone know if I can do this with frozen broccoli? Pingback: 35 Best Broccoli Recipes Ever Created – What The Hack! Can these roast at 400 for longer? Thinking of roasting multiple things along with the broccoli and they all call for 400 F.
Honestly, they’d be better off not roasting in a full oven, but you can give it a try. Roasting them at 400, for longer, is less of an issue than a loaded down oven. Let me know how they turn out! This is one of my son’s favorite recipes. The recipes are awesome, but I wish you included nutrition information with your recipes. Hi Ron. This is such a simple recipe it would be very very easy to look up the nutritional info on it if you really want/need it.